It's hard to believe the PlayStation name has been around for 15 years! I can remember when I got the first PlayStation (heck I remember playing the Nintendo when I was two!). PlayStation has brought us some amazing games over the years, many of which got their start on the original PS. One of my favorite games of all time was Twisted Metal (which is in development for PS3, woot! ), and the Resident Evil series. 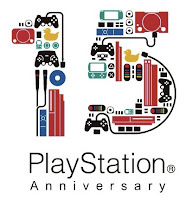 Joystiq has a nice image of PlayStation through the years, check it out and their article here. Here is to 15 more years of gaming! :) With Microsoft and Nintendo and now Apple and Android in the ranks (R.I.P. SEGA, but at least you still make games), it's a great day to be a gamer. If you have always wanted to try some apps, but you need to buy them.